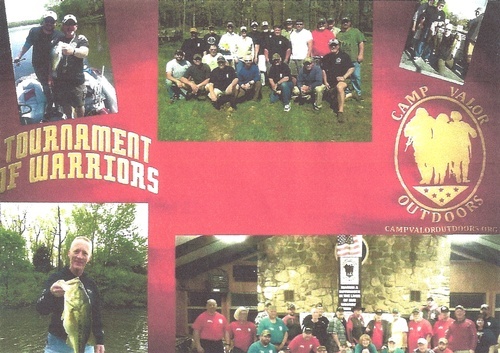 Camp Valor Outdoors in partnership with Leadington VFW Post 5741, Farmington VFW Post 5896, DAV Chapter 12, American Legion Post 416, AMVETS Post 113, and Project Warrior X (all 501(c)(3) charities) are honoring a select group of wounded veterans with a private fishing tournament at S Bar F Scout Ranch on April 24 & 25, 2019. Your tax-deductible donation will help with lodging, food, and equipment for these warriors to ensure they have a memorable experience. All donations need to be made to the Leadington VFW with a copy of this form ​ to ensure the funds go to the sponsorship of this incredible event. All sponsorships received by April 15, 2019, will be recognized on a banner at the events and at the fish fry at the Leadington VFW on April 25, 2019, at 7:00 p.m. All sponsors and their families are invited to the fish fry. Please select your sponsorship level on the form and mail it with your check to: Leadington VFW Post 5741, Tournament of Warriors, PO Box 767, Park Hills, MO 63601. You may also pay in person with check, cash, or credit card at the VFW in Leadington. A receipt will be provided for all donations for tax purposes. Camp Valor Outdoors provides FREE guided outdoor recreational and therapeutic activities for Wounded Veterans to reconnect in the outdoors and assist them through the healing process. Contact Major John Schwent, USMC (RET) at jschwent@campvaloroutdoors.org for more information.